Deciding which battle in the Pacific War is the bloodiest all depends on what numbers are being counted. Convincing arguments can be made for Tarawa, Iwo, Okinawa, and Peleliu, and possibly others. One island’s name is not on the list. But it could have been. The Japanese “fortress” of Rabaul had 60,000 soldiers, over 350 miles of tunnels, many airfields, and heavy defenses of all kinds. It was the largest case of the “bypass and let them wither on the vine” strategy the Allies pursued in the Pacific. And in fact, MacArthur considered it too large to bypass...too important to leave behind. He was overruled. 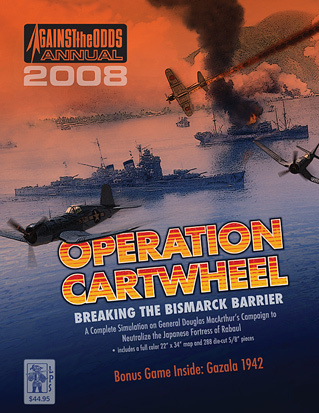 Operation Cartwheel was a miniaturized version of Allied Grand Strategy in the Pacific—a multi-pronged advance aimed to make it difficult for the Japanese to focus their responses... a jumping from air base to potential-next-airbase. (MacArthur called it, “Advancing the bomber line.”) And, most of all, the novel concept that not every Japanese stronghold needed to be attacked at all. Some 13 different invasions or operations were included, with flexibility for adjusting both timing and target as the situation demanded. In fact, the original goal of Cartwheel (called “Elkton” when first proposed) was the capture of Rabaul. After much discussion in the highest levels (including the Combined Chiefs of Staff, Roosevelt, and Churchill), and overruling MacCarther’s own objections, Cartwheel’s final objectives shifted to the Admiralty Islands, bypassing Rabaul and setting the stage for the invasion of the Philippines. Now, you can take charge of difficult decisions. The Allied commander must juggle resources at the end of a long, thin supply line. He must take risks to succeed. The Japanese commander must counter Allied strikes...fighting to delay, while always seeking the chance to strike back and make Allied risks more costly than they can afford. 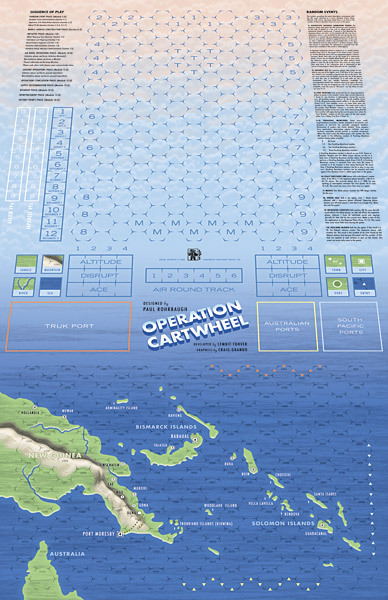 With 288 5/8" counters and a 22 x 34 inch map (each hex representing about 100 miles) Operation Cartwheel integrates separate ground, naval, and air games. Logistics is key, as it was at the time, but not a burden in game mechanics. Make yourself a lucky owner of this challenging look at one of the core campaigns of the Pacific theater in WWII. As always, the Annual features a “double-length” magazine, with an in-depth look at the history behind the game, plus other articles, and an assortment of replacement/improvement counters from that year’s games. This Annual also features a bonus game on Gazala 1942, using the Stand at Mortain game system, with a full color (and larger than post card!) map and 64 die-cut 5/8" counters. Like all Annuals, the biggest challenge is getting everything back into the box! Get yours today. See more map and counter graphics for this game. 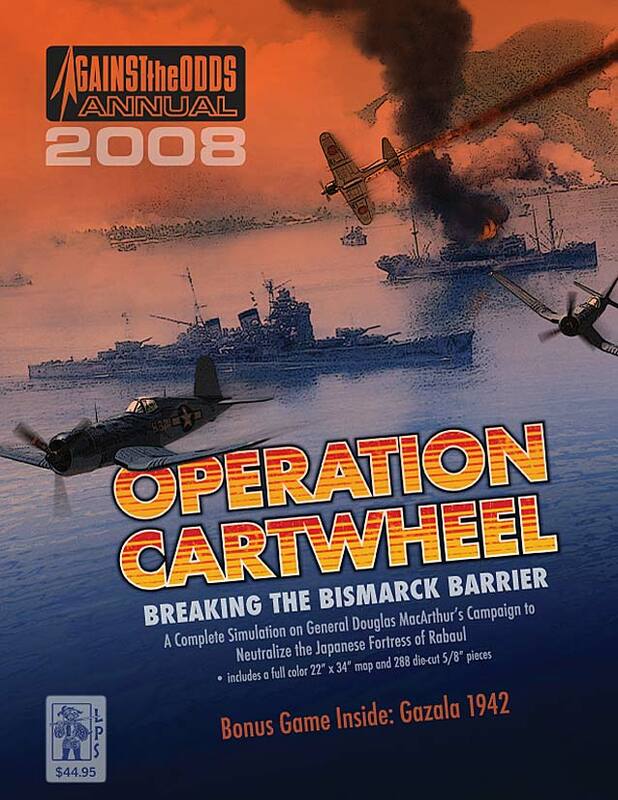 Download the rules to Operation Cartwheel (a large file in PDF format). Download a sample article (in PDF format) from this Annual.